Today we kick off an exciting year of interviews with debut authors and illustrators (in addition to seasoned professionals). 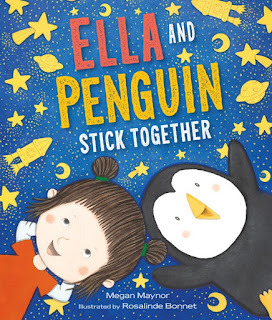 First up is picture book author Megan Maynor www.meganmaynor.com whose debut picture book, ELLA AND PENGUIN STICK TOGETHER, just released this week. be sure to enter her giveaway at the end of this interview! Previously, I worked as an advertising copywriter. I was drawn to picture books because they looked like fun and not too intimidating. (Similarly, I was drawn to advertising because it looked like fun and you could have toys on your desk.) In both cases, the artful simplicity of the final product belies the work that goes into it. Also, in both cases, once I figured that out, I was already hooked. I put in the hours. Congrats on your debut, ELLA AND PENGUIN STICK TOGETHER! Tell us about it and what inspired you to write it. The idea came in part from goofing around with my kids, saying things like, “We need some milk. Better stop at the library.” And they would say, “Noooo! There’s no milk at the library!” And so on. It got me thinking about how funny it is to kids when you mix things up, and how much fun it is for them to be the experts—to have the knowledge to correct you, the grown-up. So, I wrote a funny conversation between Ella and Penguin where Penguin was always mixed up about everything. It was funny. But it wasn’t a book. It wasn’t a whole story. It was a girl and a Penguin having a conversation. Thus began the years-long journey of figuring out what the STORY for these two characters should be. 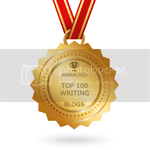 Was your journey to publication long and arduous, short and easy, or somewhere in between? 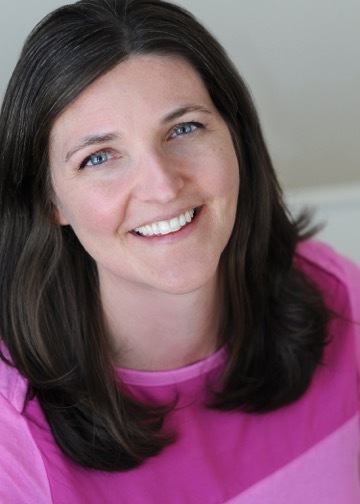 From the time I earnestly started writing for children until I sold my first book, it was ten years—then two more years before the book hit the shelves. So, the process was long, but I wouldn’t necessarily say arduous. Discouraging at times? Definitely. But it was also encouraging enough, at just the right intervals, to keep me going. One of the upsides of the long road, is that I’ve had time to connect with the children’s literature community and find my people. So now, as we’re hitting some milestones, we get to celebrate TOGETHER! More picture books. Always more picture books! What advice would you give to aspiring authors to get their picture books published? 1. Read the canon. Read the classic works in our field. And read books from the last five years. 3. Read your work aloud. 4. Don’t forget to submit your work! Sounds crazy, but sometimes writers revise and revise and revise and are too exhausted, nervous, intimidated or overwhelmed to complete the submissions process. Your story needs to eventually hit the pavement and look for work. And while it’s out there knocking on doors, start the next story. If the first story cannot find a job, pat it on the back, say “good try,” and keep going with the next story. I was really into airplanes and aviation when I was younger. (I blame Top Gun.) I took flying lessons when I was still a teenager and could pilot a little two-person plane. I was *this close* to earning my pilot’s license. Congratulations. I'm looking forward to this book. My favorite line: "Your story needs to eventually hit the pavement and look for work." Congratulations! Nice interview, too! Good advice about always working on your next story. Your book looks lovely! Congratulations! Great interview! 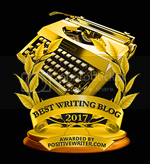 I love what you said about the long and sometimes discouraging writing/publishing process: "But it was also encouraging enough, at just the right intervals, to keep me going." I completely agree. Best of luck on your new release--it looks adorable! Can't wait to read this book -- so fun! Can't wait to read Ella and Penguin. It sounds and looks charming. Lovely! I love the fact that the author persevered for 10 years...simply amazing. I agree with Lori's comment above - a little encouragement at the right moment is so important! Congrats on Ella and Penguin! I can't say it enough - I love this book! Great interview too!! Ten years sounds just about right if you end up with such a cutie of a book. Thanks for the giveaway. Congratulations! Great idea for a book. Congratulations! This looks adorable and I love penguins. Congratulations! Thanks for the encouragement to persevere! Congratulations on your books! I like how you got your idea. Congratulations!! Thanks for all your advice and encouragement. Congratulations on this adorable book! Great interview. Congratulations, Megan! It looks like a very sweet book. Looking forward to reading it! Congrats Megan! I can't wait to read you book.